Took my 2006 XC90 (with T5 engine) in for an oil change at the dealer. They told me there is sign of oil in the big hose coming out of the crankcase. This is a sign of a clog PCV system. Dealer quoted me $350 to remedy this. I just called a highly rated independent Volvo garage (from Yelp), they quoted me $525. I asked why are they charging so much? He said looking at the dealer quote, it looks as though they are just replacing the hose. He added, they actually take apart the crankcase, etc to correct the problem. The Volvo PCV system looks complicated with a bunch of hoses and oil trap. Is the independent guy correct to take everything apart? Does the dealer quote of $350 only change the hose and not look at other part of the PCV system? I appreciate suggestions from anyone having dealt with this before? I would strongly recommend replacing the breather box and cleaning the banjo bolt as well as replacing the hose. Depending on how bad it is I would recommend replacing everything and cleaning the block ports. Thats what I do but it does cost a lot. This happened to my 2005 XC90 2.5T @80K, and the fix was $22. If you have more than 140K, then do the complete PCV job, which is a pain. But if you have around 80K, chances it is simply a broken hose. After my fix, I checked the vacuum at dipstick using glove/rubber band method ---> good suction, no smoke. So I didn't overhaul the PCV system as there is no need. You can find a comprehensive overhaul of the PCV in matthews volvo website, I wrote a very long DIY using generic 5/8-inch hose. You can search for it, if interested. Basically, PN 30713469 (plastic) has been replaced by PN 8692217 (rubber), $22 at dealer. Believe it or not, PN 8692217 was used in Volvo 850 and S/V70 for years without issues, then the Volvo engineers, over some beer and pizza...lol, decided that plastic was better, thus PN 30713469 (plastic), which was a disaster. So they now got rid of the plastic pipe and went back to rubber hose. The good news is you can replace this w/o removing the manifold. PS: Edit, if I have to do it again, I found another trick: from the driver's side, you will find some roomy space to reach your hand from the driver side, underneath the manifold to reach the oil trap to insert the hose. This repair is very very simple using basic tools. All you need is a 16-inch long screwdriver, which is about $10 at Sears etc. Hi all, thanks for the replies. CN90, my 2006 XC90 only has 51K miles. I will try the suction test from oil filler. But from what I gather, this could be just lose clamps or defective hose? Which leads back the original question of the dealer only charging $350 for the repairs, which amounted to only changing the hose. Sounds right? I have attached a picture of the oil on the hose. $350 to change that hose is a ripoff. The hose and clamps are about $45. Labor is an hour. So even at $150 an hour, you'd be at around $200. The photo you showed is oil on the Turbo air hose. It is NORMAL to see some oil on that hose. So, relax. The hose I was talking about: do a google search images of "Volvo 8692217" and you will know what I am talking about, basically the hose that runs from the oil trap to the top of the engine. If that hose is broken, your cost is $22, then get the appropriate clamp from local autoparts store (bring the hose there so they can get the correct clamp for you). Clamp is about 50 cents/each. Labor for the hose 8692217 is about 15-30 minutes max. I did this, so I know. Too bad you don't live near me, otherwise I can help you. Last edited by cn90; 01-06-2015 at 10:33 PM. Also, your picture did not load. My post was in regard to the same hose cn90 is talking about. The labor I mentioned is how long it pays, not how long it takes. I can get them done in about 6 minutes, including using the OEM clamps. Edit: Got your image to load. Most cars have oil on that hose but that doesn't mean it's normal. Oil is not supposed to get into the intake system. My car has 140,000 miles and that hose is bone dry. But I also change my oil about every 4000 miles so my PCV system is as good as new. And yes, it could be due to a clogged PCV system. Mileage is not an indication of when to replace the breather box. The amount of oil in your picture is very minimal. However, if the hose cn90 is talking about is broken, I would replace it and then check the PCV system. Last edited by ES6T; 01-07-2015 at 06:25 AM. Thank you all! I found the hose. Base on the picture and not having the scale, I thought it was a big hose. I see it is the plastic type and I indeed see some oil on it. I think I can change this myself with PN 8692217 (rubber). But for some reason if I cannot get it hook up to the Oil trap, is it okay to drive it as is to my independent guy about 22 miles away? Safe to drive to indy. On the other hand, this is not hard at all, with good flash light and diligence, you can do it. Level of difficulty is 2 out of 10. Very easy. - Long screwdriver, you can get the 16-inch screwdriver at Sears etc. - Use appropriate socket, enlarge the hose where it is connected to the oil, let it sit for 15 min or so. This basically expand the hose a bit, then insertion is very easy. Add a little oil on the inside of the hose so it slides in. - Make sure you put the clamp on loosely first, before inserting the hose to the oil trap. Don't go back to the dealer, who just proved to you how dishonest they are. How to cut or remove the factory hose clamp? 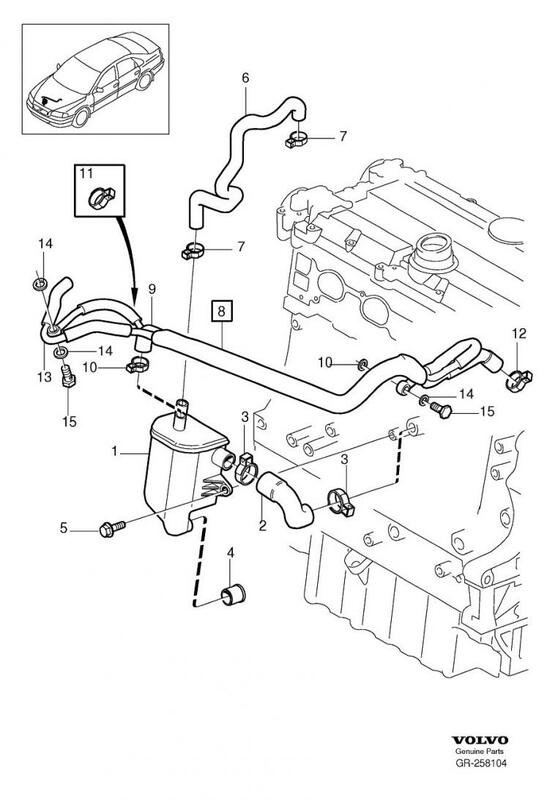 Following on the above thread I need to replace the breather hose (30713469) with the 8692217 and do not want to remove the intake manifold. Any suggestions, tricks or recommended tools for cutting and removing the factory hose clamp on the PCV box with the intake manifold inplace? I was able to remove the existing hose from the PCV box using the 16" screwdriver coming in from the driver side reaching under the intake manifold.